Still, there are stories to be told in virtually every community about DACA’s educational impact and how schools and education leaders are responding to the uncertainty around it. When reporting, be clear about whether a source’s name will be made public, advised Education Week reporter Corey Mitchell, who has been covering DACA at the K-12 level. If the person has reservations, he suggested, seek out immigrant rights organizations or similar groups that might be willing to help journalists find sources. What happens when the employment authorization under DACA runs out? In some states, Mangan noted, DACA is the only thing allowing certain immigrants to get a driver’s license. It may be difficult for college students who have DACA to stay in school if they aren’t able to work as well. Talk to those students and college officials about what this means. Losing work permits would also affect classrooms, where an estimated 9,000 teachers also have DACA protections. Understand that immigration is bigger than DACA. 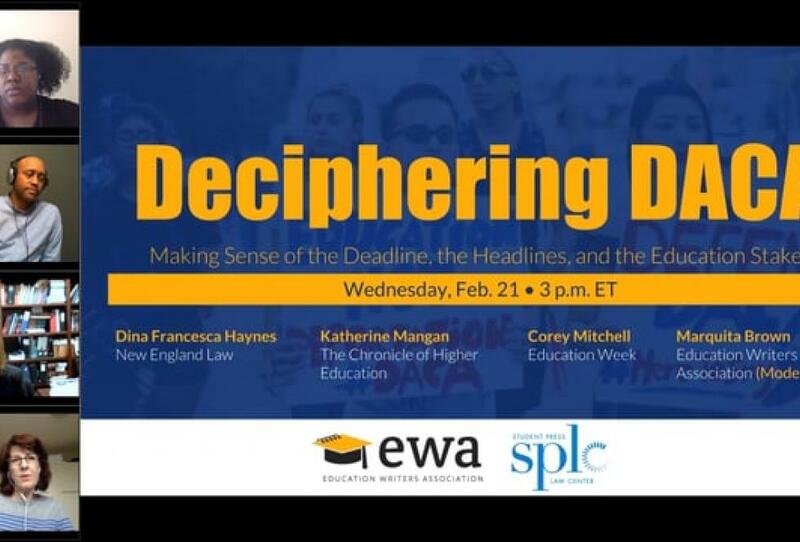 Many undocumented students in elementary and secondary schools, as well as colleges, lack DACA protection, New England Law professor Dina Francesca Haynes said during the webinar. Haynes emphasized the importance of being sensitive to that reality. The overwhelming majority of DACA recipients come from mixed status families, Haynes noted. Their relatives may include undocumented immigrants who are not covered by DACA the program as well as U.S. citizens. For some DACA recipients, that reality feeds fear of sharing with reporters their names or other identifying information that might also expose their families. As an immigration attorney, Haynes said she would advise her clients to not talk to the press. She suggested reporters look for alternatives to quoting individuals, such as talking to immigration attorneys or advocacy groups. Those people can talk about their clients without having to divulge their names she said. Do your homework. Organizations such as the Migration Policy Institute provide valuable statistics such as population estimates of DACA recipients for states and individual communities. One possible story: Request attendance data for schools with large populations of students who are English-language learners. Understand that qualifying as an ELL does not mean a student is an immigrant or that they or members of their family are undocumented. Also, schools legally cannot ask about a students’ legal status or even require documents such as a birth certificate for enrollment. Need a primer on DACA? Check out this piece from EWA Public Editor Emily Richmond.